Hydroformylation, hydroesterification and hydroamination are chemical reactions yielding weakly polar products (WPPs) and can be performed in micellar solutions. However, it is mandatory to know the extent of solubilization of the WPPs inside the micellar aggregates as well as factors influencing this solubilization. The currently existing aggregation models are not capable of describing the solubilization of such WPPs (n‑aldehydes, methyl alkanoates and n-amines) since they either neglect interactions between the WPP and the aqueous environment, the polar head group of the surfactant or the hydrophobic core of the micellar aggregate. However, none of these interactions can be neglected in the case of WPP. Hence, this project aims to investigate the solubilization of WPPs in micellar aggregates occurring in an aqueous environment. In order to model the solubilization of such WPPs, a new thermodynamic modeling approach will be developed by combining a detailed aggregate formation model, the Perturbed-Chain Statistical Associating Fluid Theory (PC-SAFT) and the Density Gradient Theory. Within this approach, PC‑SAFT explicitly enables the description of the currently neglected interactions and thus their influences on both the aggregate formation as well as solubilization of the WPPs. 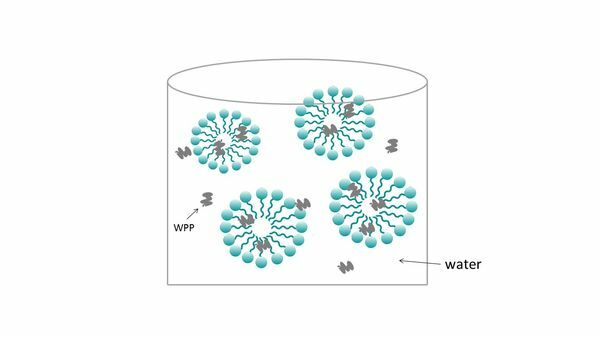 Applying this new modeling approach, the solubilization of the aforementioned WPPs will be explored for varying surfactants and also validated by experiments. With this information at hand, the partition coefficient of the WPP between the micellar core and the surrounding aqueous environment can be derived which could otherwise only be obtained experimentally with high effort. Figure 1: Micellar system containing weakly polar products (WPP), water and micells.